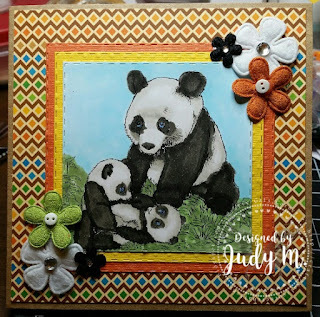 Hi All and Welcome to Challenge #147 with the Crafty Gals Corner! My project this week features an image by Morgan's Art World called "Wild 2". I really adore this image as I am having so much fun coloring all kinds of animals! This image really gives you both direction as well as freedom to create whatever details you choose. Definitely check out their images. You will be happy you did!I used Copics on the image as well as square stitched dies from Stamps Of Life and flowers with bling from Queen & Company. So we would love for you to play along! Remember this weeks' challenge is Harvest Colors, so post your image on the Crafty Gals Corner Blog for a chance to win this week's prizes! You can get to the Crafty Gals Challenge blog by clicking here. You have until 11:00 am MST on November 7th to enter! I can't wait to see what you create!